Welcome to our ever-evolving list of the best abandoned cart emails. There is a huge amount of opportunity for creativity (and conversion) in these sequences and we’re seeing some brands take full advantage. If you know of any that you want to add, please get in touch! Before we dig in, if you don’t already have sequences live…you gotta get on it. Seriously. No matter how well you think you’re optimizing for first session conversions, the average documented cart abandonment rate online is 69.38%. This means you’ll most definitely have some leakage that can be plugged with even a basic sequence. As for what you can expect in terms of performance, Barilliance analyzed 200 companies running flows and found the average conversion rate clocking in at 18%. While the best cart abandonment emails were hitting as high as 40% conversion rates. The NYC based men’s accessories brand send you the following email when you forget completing buying from their store. What makes this one of the best abandoned cart emails? The subject line of the email is specific and offers a discount of 20%. Further, it creates urgency by stating the discount “Ends soon.” and it’s time-sensitive. These little basic components are a staple of most of the best abandoned cart emails we feature AND an easy win. The email directly offers a 20% discount coupon code, reminding the user of a product they were interested in buying. Then, there’s a call to action to check out. The email ends with a contact email for user queries and an opt out of their shopping cart emails. It’s straightforward and non-intrusive. 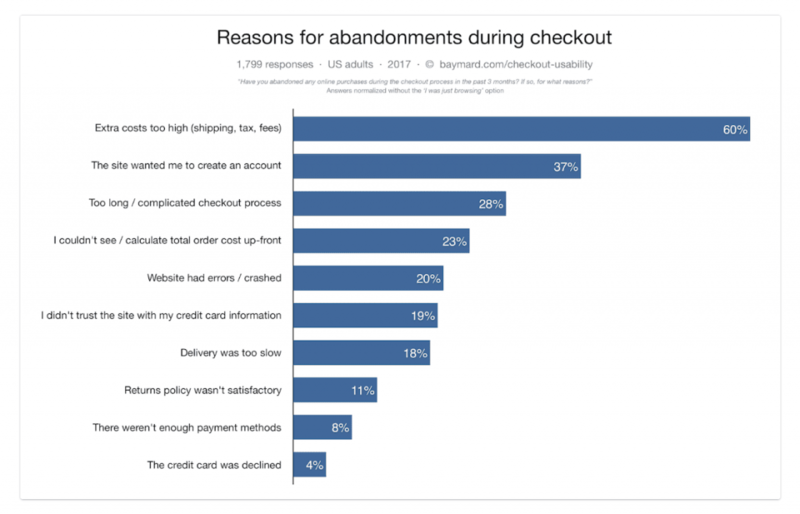 Ernest does a great job at addressing the top reason for cart abandonment by shoppers, which is “extra costs too high” as per Baymard research. The American travel and lifestyle brand, Away, sends the following email if you abandon while purchasing “The Large” from their store. The email maintains the Away branding by use of colors, its logo, and a simple design. The email with the visual instantly reminds the shopper of their abandoned purchase. The copy is on point with their brand personality. It grabs the attention with the question “Still deciding” and creates urgency in their answer stating they might “sell out.” I love this. Nailing personality puts you in “The Best” of the best abandoned cart emails. When considering the headline, think of what a friend would say if emailing you vs a company. They assure the travel shopper of free shipping in a playful manner at the bottom of the email. And they also offer an option to ask questions. Prescription glasses and sunglasses provider, Warby Parker, send the following email with subject line “Louise might be the one.” I love this! The copy of the email reflects their brand personality and shows off their unique style. It has a conversational tone and a colorful design that blends with their brand image. The subject line of the email itself reinforces the prospective shopper of their interest in ‘Louise.’ After engaging in the body of the email with the visual of the product, the CTA “Have a look” maintains scent and gently pushes the prospect to the product page. (Remember the rule: one page, one goal? It might work with emails as well). Natural loose tea seller Teakruthi sends the following email when you drop purchasing from their store. The email is written in a first-person by the founder of the company. It’s a great way to build rapport with your early customers and get feedback on your products. Remember that when you’re starting out, it makes sense to “do things that don’t scale.” Finding your 1,000 true fans is key. The message reminds the shopper that their leaves are “getting stale” with a link to their cart. Although the email doesn’t follow the usual template of abandoned cart emails, its language and copy are a refreshing change that blend with their tea brand. They use this touchpoint of a new prospect (that dropped off from their store) to start a referral engine. 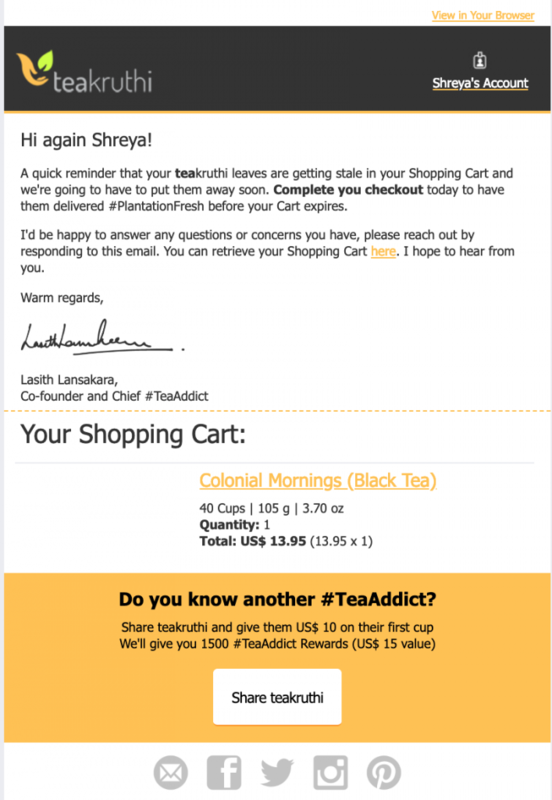 At the end of the mail, they promise $15 in rewards for sharing TeaKruthi with their #TeaAddict friends. Women clothing company, Madewell, use three prominent CTA buttons in their cart abandonment email below. Overall, the design of the email flows smoothly by showing the products in the shopping bag of the user. It has three bold CTA buttons that lead back to the Madewell store. The email ends with three more relevant options for the prospect. If a shopper is interested in checking the new arrivals from the brand, then they can make the first choice. Else, they can still explore curated ‘looks’ and start a wishlist. Isn’t a nice way to keep your audience engaged and deepen your relationship with them? The world’s largest retailer, Amazon, is quickly expanding its presence in India. It sends the following email if you get off without completing your purchase from their store. When you have a LOT of listed products on your store, then using a simple templated email might work well with your prospects. Your consumers are already aware of your brand, so a gentle nudge itself can do. That’s what Amazon does right here. The email addresses the buyer with their name (it’s personalization 101, but still useful). Then, it displays a visual of the product that the user was about to buy and a CTA to view the cart. Indeed, there are 3 clickable links in the body of the mail that can take back the user to their cart and let them complete their purchase. 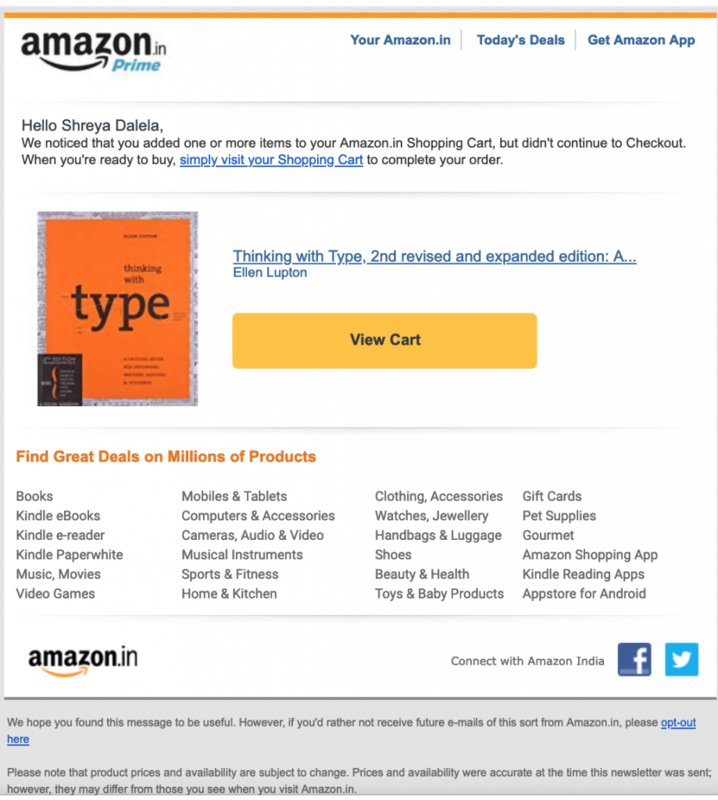 The email ends with product page links to Amazon India where the user can find “great deals.” Isn’t it a nice way to drive an interested consumer to existing offers on your site? Further, Amazon lists its Facebook and Twitter presence for connecting (which is a preferable method of communication for many consumers today). Note: Even if you don’t have a huge number of products for selling on your site, you can experiment with sending a few similar products. In the abandonment cart email below, Nykaa, a multi-brand beauty retailer, shares four similar products alongside the products in the shopping bag. They all serve as a genuine upsell that the consumer might be interested in buying. The golf shoemaker sends the following email to on the abandonment of cart. TRUE clearly mentions the benefits of buying from their brand at the top of the email. If the prospect missed their ‘30-day guarantee’ and ‘same day shipping’, then the message ensures they will be aware of it now. The body of the email contains a high-quality visual and reiterates that the consumer can wear their shoes for a week. The copy reinforces trust and gives assurance of quality (and that too in style). They end the email with the signatures of their team members. It gives a personal touch and adds credibility to the message. 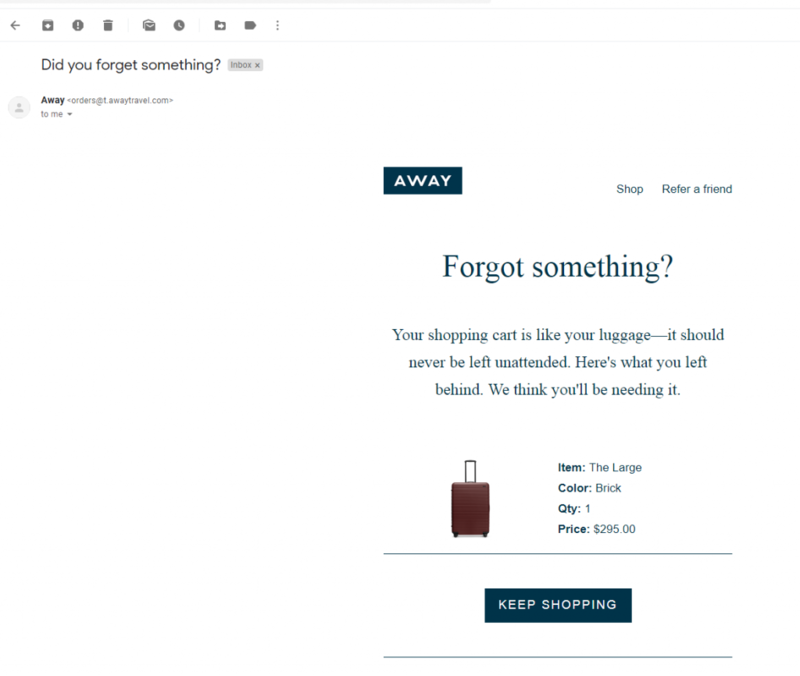 Now that we have looked at seven examples, let’s discuss how to create an abandoned cart email strategy for your brand. However, first, here’s an example of sending a cart message on Facebook. Facebook Messenger has over 1.2 billion monthly users and creating chatbots is a great automated way of reaching them. 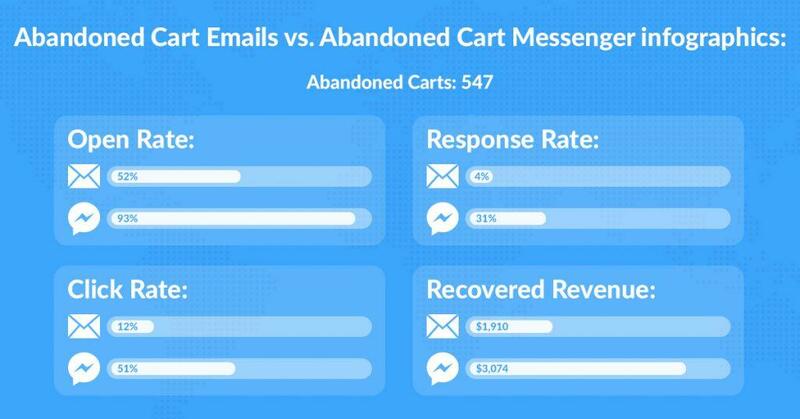 Indeed, Recart found that the open rates, response rate, click rate, and recovered revenue are all higher in Messenger. 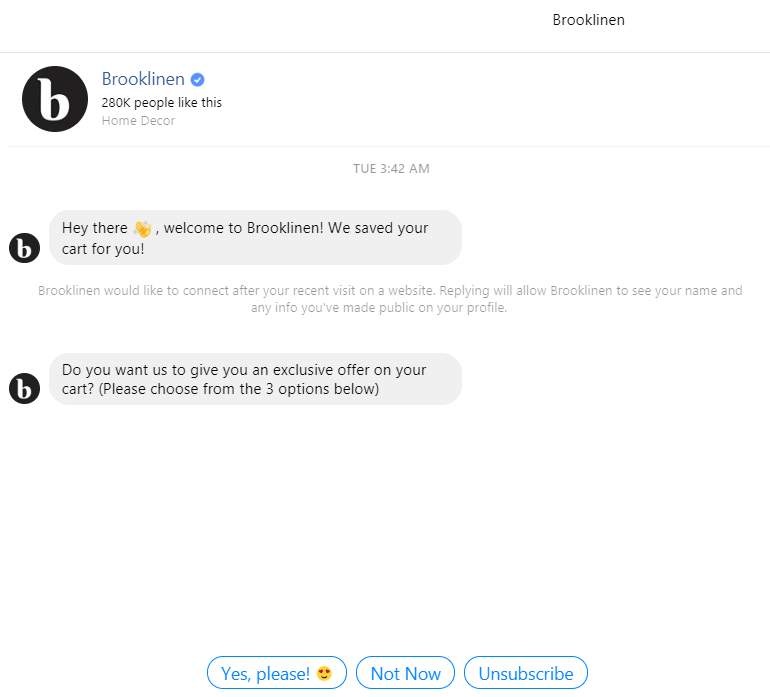 You can give Messenger marketing a shot by using a tool like Recart (it integrates with stores created on Shopify and WooCommerce). Now that we’ve looked at a few examples let’s begin with the creation of a strategy. Here are five ways to recover lost sales from your store. Even if your prospects don’t check out, you can solicit their emails using email optins. Exit-intent pop-ups might be the most effective kind, but they will also likely be annoying for your audience. You can explore the possible email collection options here. 35% of recipients open emails solely based on the subject lines. Your goal is to be specific by reminding the recipient of the product they abandoned. Simultaneously, you need to pique the curiosity of the hesitant customers so that they open your email. 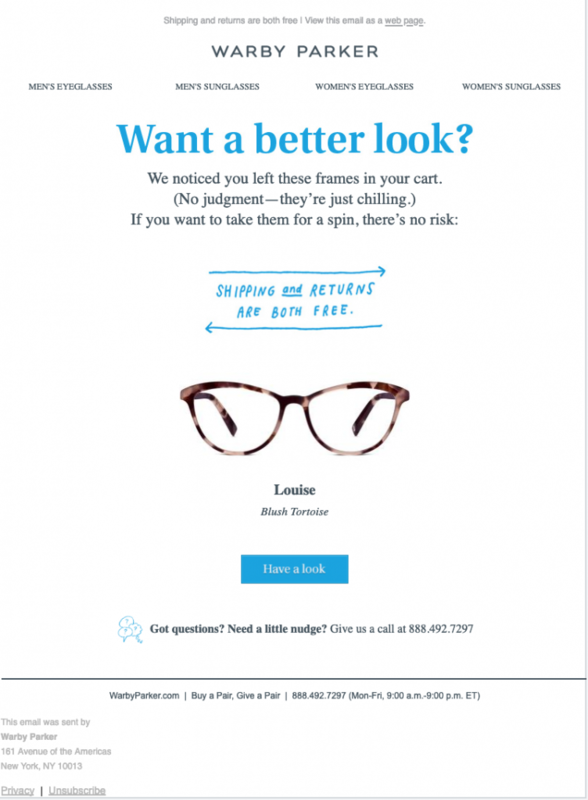 Remember how Warby Parker used a colorful picture of the item abandoned from their store and was playful in their email copy? That’s how you want to approach your email body. Being humorous (if it goes well with your brand) will help you stand out in an otherwise boring cart reminder message. 90% of Ecommerce leads turn cold in an hour. Or do they? Well, It makes sense to send an email to a shopper when the product is fresh in their minds (preferably, the first 24 hours). However, the ticket value of your product also matters. If you’re selling a laptop, then the consumer decision-making process is more intricate and can take time as compared to selling a T-shirt. As I have told in the direct to commerce brands article, consumers are increasingly demanding a personalized experience. Do more than addressing the prospect by their name and sending an automated message. Make your recipient feel like they are communicating with a friend. It’s Your Turn Now To Follow These Top Abandoned Cart Email Examples! You can’t stop those casual browsers from dropping shopping carts on your site. They might find your shipping fees higher or your checkout process complicated. However, you can get a decent number of these prospects back to your store and persuade them to buy. I showed you examples of a few retailers that reassured the prospect with discounts, free shipping, and other techniques. 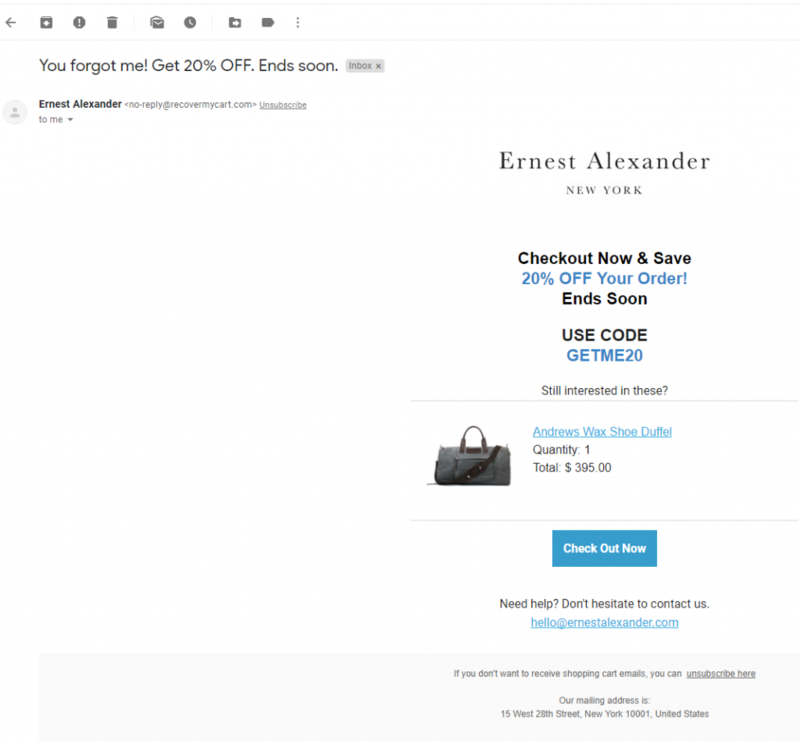 Hopefully, these abandoned cart email examples have inspired you to optimize your re-engagement campaigns. Finally, it’s also worth experimenting with abandoned cart messages on Facebook as the consumer attention shifts towards social media. I would love to hear how your cart abandonment emails stack up. How much revenue have you been recovering? And how you plan to use the above examples? Let’s discuss in the comments below. Do you think you’ve got one of the best abandoned cart emails? We’d love to check them out. Please get in touch.